New York is still the epicenter of private equity, as it has been since the industry's beginning. Wall Street was already around when PE got its start, and the important supporting actors—namely lenders and bankers—were all a taxi ride away. The same is true for Silicon Valley and the venture industry, where it's important to be within a 20 minute car ride of a portfolio company in case something goes haywire. It's easy to forget how important physical contact is when it comes to dealmaking, which is why associates and VPs are flown out to Texas and Ohio and Wisconsin to talk to the CEOs running potential investment targets. New York isn't in the middle of the country, but it is in the middle of the financial action, and that model has held up over the years, given PE's focus on fairly cut-and-dry segments of the economy. But things have changed over time. When energy became a prime target, PE firms bought office space in Texas, either as brand new firms or as established ones planting new flags in the south. Today's exodus is heading further west, to the software mecca of San Francisco. Over the past two-plus years, the Bay Area's share of fundraises has ballooned compared to other regions. Notably, that change has taken place in the middle of an across-the-board boom that has benefited every other region—just not as much as the Bay Area. Let's take a look at the numbers. New York, for instance, headquarters over $200 billion in capital raised since 2017, a few notches above the $170 billion raised there between 2015 and 2016, per PitchBook data. 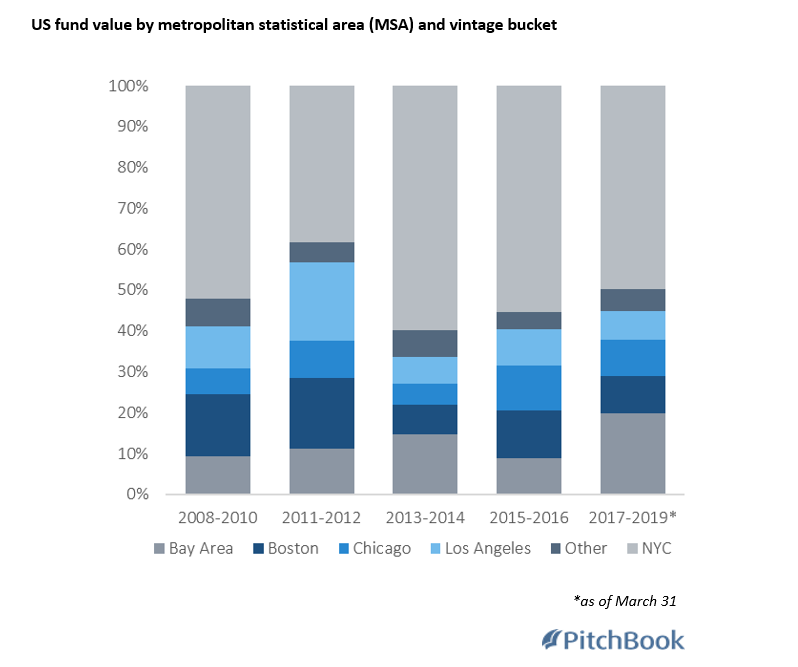 Boston, Chicago and Los Angeles have also raised increasing amounts of capital in the last few years. The Bay Area's take has been much more significant, however, rising from $27.4 billion raised between 2015 and 2016 to over $80 billion raised since 2017. That deluge of capital includes several high-profile tech funds raised by the likes of Vista Equity Partners, Silver Lake and Francisco Partners. We should add Thoma Bravo to that list, as well, though the firm is split between the Bay Area and Chicago. Heavily chasing software deals, the firm has notched several top-quartile performances going back to 2000, and the same can be said for Vista and Silver Lake. As time goes on, we may start to see more of a bifurcation between New York and San Francisco, two cities where PE is now much more strategically located. Related read: Which PE mega-funds are coming next?